Well, isn't that something. Monty Python veteran Terry Jones hasn't made a movie for nearly 20 years and then he resurfaces with Absolutely Anything for which he could also reactivate all still living ex-members of the comedy group and Robin Williams for guest roles. 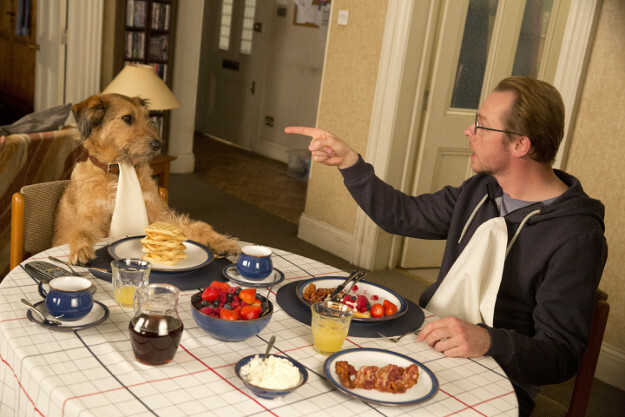 The lead role is played by Simon Pegg who is gifted the power to do - well - absolutely anything by the Python aliens. In UK cinemas, the film was censored for the 12A rating because some language would have caused the higher BBFC 15 rating instead. Fortunately, this censorship will not continue on the UK home video releases. Even though the current, preliminary artwork still has the "12", the BBFC's database shows that the video rating is in fact "15". The UK Blu-ray gets released on December 7th, 2015. You can order it at Amazon.co.uk.